It appears most of Iowa’s corn and soybean crops survived this month’s cold and wet weather. Iowa State University Extension Agronomist Roger Elmore says plants quit growing, especially in northern Iowa, when widespread frost hit on May 9. Fortunately, most of those plants escaped injury. “We’re losing a few plants, but it’s certainly not enough to justify a replant,” Elmore said. The frost was followed by several days of cooler than normal temperatures and heavy rains. “When that happens, the whole plant basically goes on hold and it’s possible for various pathogens to invade the plant and kill it,” Elmore said. “The encouraging thing is – this time – that did not happen. 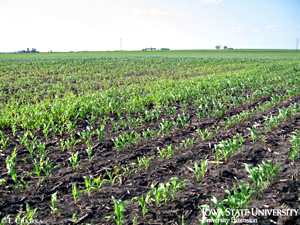 It did in a few cases, but by and large, the plants survived that threat and are starting to regrow.” This week’s crop report showed 96-percent (96%) of Iowa’s corn and 53-percent (53%) of soybeans are planted. Elmore says some farmers in south-central and southeast Iowa have fields that are still flooded. “Those fields that are under water for 2 to 4 days…there are parts of those fields that will need replanted,” Elmore said. Farmers who are forced to replant in late May lose yield potential and money with the cost of additional diesel fuel and seed.